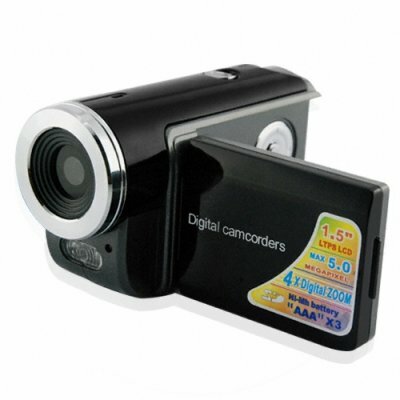 Successfully Added Digital Camcorder - Compact Video Camera With MPEG 4 Recording to your Shopping Cart. Digital Video Camera in an easy travel size. New wholesale Digital Camcorder with 2.0 Mega pixel CMOS imaging sensor, and with the ability to take up to 5MP photos. It is compatible with SD cards up to 8GBs and has a 4x digital zoom capability. Features high quality 1.5 inch color LCD and takes good quality digital pictures and videos for a very low wholesale price. It uses 3 AAA batteries, so no need to worry about buying expensive proprietary batteries. Works in 8 user selected languages with a friendly interface and menu system. The camera comes out of the box ready to start taking pictures, and is available at the usual Chinavasion wholesale discount. Get your supply now as this one is going to be the must have item for the holiday season!.